What memories are made of. Err… Purple? I would like to think that I have an eclectic and varied taste in music. It’s the art form that most influences my day to day life. Long sessions in the studio are supported by little 2-7 minute gems of audio inspiration. For the brief period that it ran, we were lucky to live not far from the Hop Farm Festival. Each year the festival would attract 30,000 plus visitors per day to enjoy the music and Kent sunshine. In 2011 we were treated to the phenomenon that was Prince. I had followed his success over the decades and couldn’t resist the opportunity to see his showmanship. With a 2 hour long show and consuming a few beers during the performance, it meant an inevitable trip to the dreaded festival loo. With the music cranked up to 11, I walked through the toilet entrance to be greeted by the sight of a dozen grown men stood eye to eye across the urinal, each holding a plastic pint in 1 hand and all screaming ‘LITTLE RED CORVETTE, BABY YOUR MUCH TOO FAST‘. You can’t make that kind of stuff up. It’s what memories are made of! Symmetree Tripomatic Prince forms part of the artist colour inspired pieces which so far include Yves Klein, Mark Rothko, JWM Turner and David Hockney. 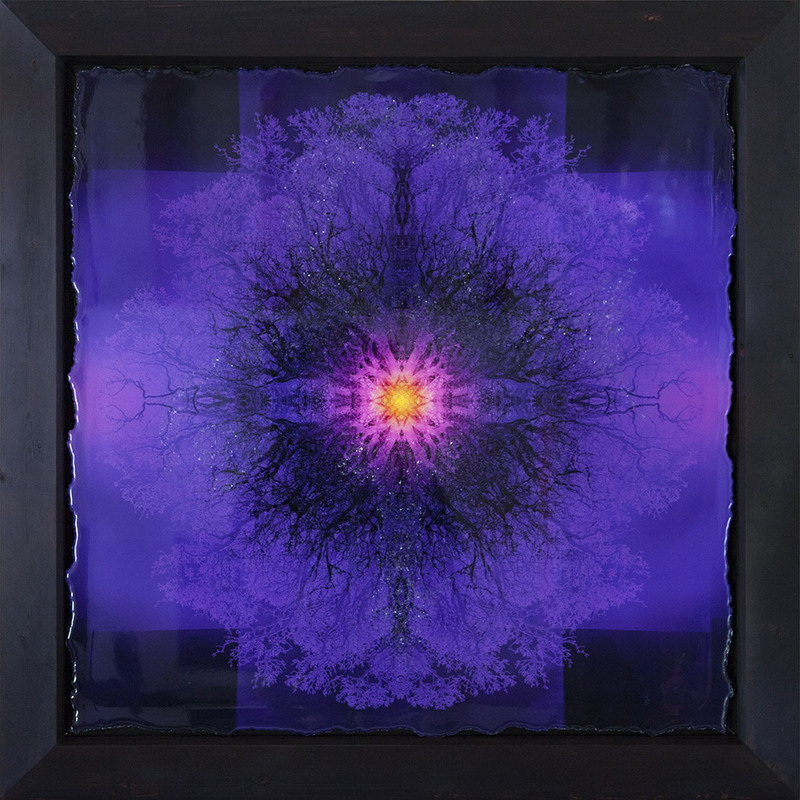 Symmetree Tripomatic Prince is framed and set in resin. Available through Clifton Fine Art in Bristol.